Make a 2D histogram plot. Normalize histogram. normed is a deprecated synonym for this parameter. An array of values w_i weighing each sample (x_i, y_i). The bin edges along the x axis. The bin edges along the y axis. A colors.Colormap instance. If not set, use rc settings. A colors.Normalize instance is used to scale luminance data to [0, 1]. If not set, defaults to colors.Normalize(). Arguments passed to the Normalize instance. Currently hist2d calculates it's own axis limits, and any limits previously set are ignored. Rendering the histogram with a logarithmic color scale is accomplished by passing a colors.LogNorm instance to the norm keyword argument. 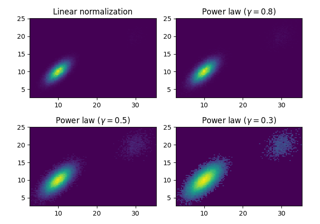 Likewise, power-law normalization (similar in effect to gamma correction) can be accomplished with colors.PowerNorm. All arguments with the following names: 'weights', 'x', 'y'.